Well…so first we have this Finnish band named partially after Pazuzu, a demon of Babylonian and Assyrian lore (whose biggest claim to fame must be his main villain role in the horror classic The Exorcist) who happens to be coloured orange (English for “Oranssi”) in this case. Then mix that image up with a very intriguing take on psychedelia and black metal and…well and. To paraphrase our own Charles' well-made note in his review of OP’s previous album, Muukalainen Puhuu, this is no ordinary black metal record either and neither is the band. The kind of dark, grim atmosphere and raw production backing up the raspy and ranting singer is straight up the standard black metal aesthetics, but the music is mostly something different in versatility. the BM is accompanied by a lot of effect-laden guitars that remind me more of Hawkwind than any frostbitten, corpsepainted norseman. The psychedelia and occasional bursts of noise make for an even more quirky soundscape that really succeed in bringing a spacey wibe into the mix. Ghatdamn, I’m rambling here but honestly, Kosmonument has got me bewildered to a certain point. Not the craziest thing around or most technical or grimmest by any means but…there’s just something weird yet intriguing. If “out there” experimental metal is your thing, then you could perhaps even add 20 odd points to my score. If it’s not, subtract that 20 from my score if not even more. 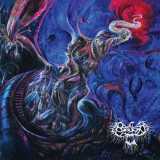 An acquired taste but impressive in its own oddball way, this offering from Oranssi Pazuzu, it is. Yes.